In marketing, we know that it takes multiple interactions with someone before they are ready to act on our message. When done right, we don't assume someone is interested or motivated to hear what we want to say. Marketers care about what does someone want to hear, not what we want to tell them. This single insight is the key to success to teaching anyone about anything. As part of that, how do we break down the information into a way that will keep interest and engagement, and actually lead to a desired behavior? 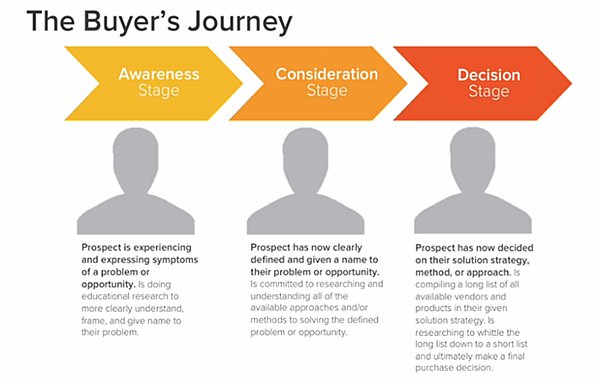 There is a 3-stage approach we refer to as "The Buyer's Journey." This is not Beginning, Intermediate and Advanced. Rather, it looks at the motivation that is driving someone. Motivation is what drives behavior change. First, I have a situation and I don't have language for it. I need to figure out how to think about it and how to even research options. Second, I now know what the problem generally is. Now I need to understand ways to address it, and to fine tune what specifically is my problem/challenge/opportunity. Third, I know what I'm trying to solve for and now just need to compare options of which solution I'll use. I would suggest that this proven technique of how to present information in a way people are ready to consume and act upon should be the model for modern Learning and eLearning programs. What would that look like in "real life?" With all the buzz around micro-learning ("microlearning," thank you Grovo), there is a lot of debate about what this term really means. While the debate will continue, one approach that can work well is to use the content strategy marketers have been using for years with blogs, infographics, videos, social media posts, etc. That is, write shorter pieces that address just one point. Think of it as, "what is the question someone might type into Google...and what would the page talk about that Google showed as its top result?" The answer to the question is a page that talks just about the answer to that question. The marketer will provide recommendations of related readings, taking people down paths that build upon the information on that first page. We will propose an ideal path, and track every step of the journey. what mix of content works best to get someone through that path - text, videos, images, etc. All of these will be measured and analyzed against the initial behavior that was desired as the ultimate outcome. how to be better leaders, how to communicate, etc. The buyer's journey has been the key to our success. Perhaps it's time for the Learning community to employ this process more intentionally as they help people on their Journeys. Marketers have been developing widely consumed learning content that has achieved desired behaviors.